Our speaker this evening was Brian Carre, North Grenville's chief administrative officer. Brian shared his background with us as well as explaining what his role in the municipality is. The role of CAO is to be the interface between elected council and municipal staff. Staff he explained are there to provide advice to council with respect to provincial law and ensure that the decisions council make are properly executed. As CAO, he is responsible for coordinating the execution of these decisions across the various municipal departments as well as overseeing the daily operations of the municipality. 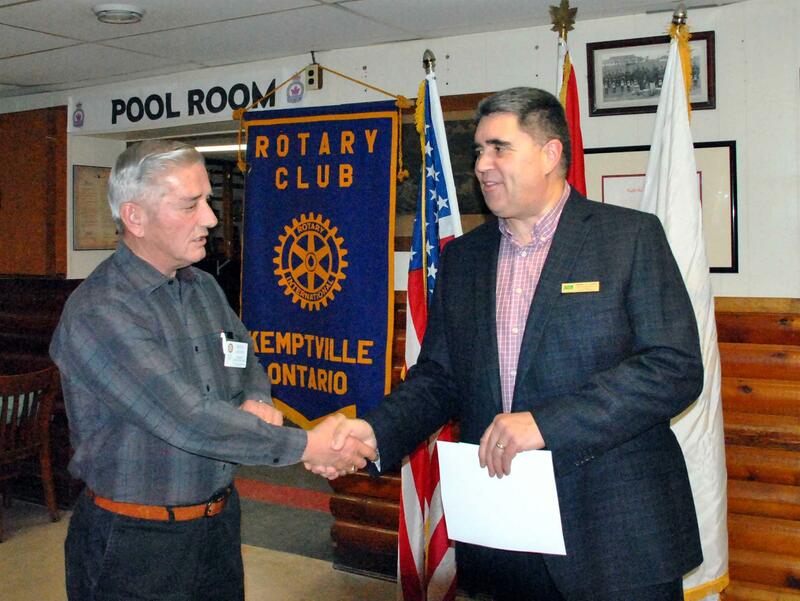 Pictured below, Brian accepts a cheque from Rotarian Serge for the installation of two benches in Curry Park.